In our days, now that we observe an upsurge of anti-Western rhetoric in Russia, we are pondering again upon the innate cultural orientation of Russian civilization. Moscow, The Fourth Rome, the new book by Yale professor Katerina Clark, is a very rich resource among the centuries-old contemplations about the Russian search for national identity. From the Stalinist 1930s, whose image in human memory and historical writings is overshadowed by the Great Purges, Clark has chosen an intriguing subject for investigation: the cosmopolitan trend in Soviet high culture that aimed to create a pan-European fraternity of Marxism-oriented intellectuals, a kind of new Republic of Letters. Though official ideology in the mid-1930s tended towards ‘national Bolshevism’ with its Russocentric, xenophobic focus, international orientation was another option in Russian culture. These trends coexisted and the author aims to add to the well-documented turn to Russian nationalism ‘by pointing to a simultaneous, if more precariously flourishing, internationalism’ (p. 7). Clark’s choice of topic reflects the increasing interest of scholars in side-currents of history, away from its mainstream, focusing instead on developments that failed to be fruitful and withered away while other tendencies triumphed. Such studies depart from a one-dimensional view and in doing so immensely enrich our understanding of the past. This new approach is especially visible in cultural studies, the field in which Katerina Clark is one of the pathfinders, and that now produces many innovative views on Soviet Russia. Clark shows how the messianic element of Bolshevism in the 1920s found its outlet in the Comintern politics of direct sponsorship and instigation of a global revolution. When this tactic brought no results, the drive to bring ‘salvation’ to humanity faded, but did not disappear. In the 1930s, as Clark illustrates, it was embodied in the practice of cultivating cultural networks on the European continent in order for the Soviet mission to win recognition by other (soft) means. 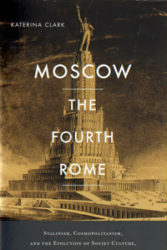 The title of the book shows that Katerina Clark sees this trend in Stalinist ideology as parallel to the 16th century concept of Moscow as the Third Rome. After Constantinople, known as the New Rome, had fallen to the Turks in 1453, growing Muscovy strove to become a new spiritual center of Orthodox Christianity. This idea became an ideological justification for its imperialistic ambitions. In the 1930s, the state ideology represented Moscow’s determination to fulfill the role of cultural stronghold in Europe and, indeed, to lead world culture. The international element in the Stalinist cultural horizon was present in the ‘cultural revolution’ as it progressed in the beginning of the 1930s. It ‘sought to propel the populace to a truly socialist consciousness, […] to propel the country and by its example the greater world’. The most significant part of Clark’s book is the study of state ambition, self-representation, expressed in official rhetoric, cultural politics and writings of the Soviet intellectuals. During the reconstruction of Moscow that started in 1931, Western models served as reference and example. The emerging cult of Moscow celebrated it as a world center. According to Clark, the goal of the reconstruction was not so much modernization, but rather the building of a model city. In terms of style, the new Moscow was seen as an heir to the architectural greatness of Rome, with references to classical and Renaissance heritage. The cultural panorama of the decade, which is placed in the context of foreign and internal politics and European intellectual debates, is exhaustive and comprehensive. The author focuses on how the concept of socialist realism, essential to Soviet culture, was debated in the artistic and literary scenes. Clark gives a broad perspective of all genres and arts in which international exchanges and cooperation evolved: first of all literature, architecture and cinema, but also theater, photography and opera. The stories of the four personalities, or cultural functionaries, who worked as intermediaries, form a perfect illustration of the decade: Sergei Eisenstein, a film director, Ilya Ehrenburg, a journalist, Mikhail Koltsov, a journalist and publisher, and Sergei Tretyakov, a journalist and filmmaker. In a time when the Soviet Union became a closed society, they played the role of emissaries, selected to negotiate with the outside intellectual world. Clark delicately notes that they combined their cultural functions with work for the Soviet state or for ‘specific Soviet bodies’ (meaning security police, at least in the case of Mikhail Koltsov – famous for his panegyrics dedicated to the OGPU/NKVD and condemnations of the ‘enemies of the people’). Their ideas and artistic endeavors were deeply entrenched in European culture and Western models. Negotiating between the Soviet Union and the outside world, these selected representatives of the Soviet cultural elite courted Western left intellectuals, attracted them into the Soviet orbit, and organized visits, tours, translations and joint artistic projects. Among the visitors were Bernard Shaw, Lion Feuchtwanger, André Gide, Bertolt Brecht, Romain Rolland, Walter Benjamin, Henri Barbusse, and many others. The interest was mutual: in a time of European economic crisis, French, German and British intellectuals looked with hope to the socialist project – especially when the fascist menace became ever more threatening. At the end of the 1930s, the Western intellectuals regarded the Soviet Union as the main bulwark against fascism and it made them reluctant to voice their humanitarian concerns about show trials and purges in the country. The cosmopolitan trend went through several stages, with an upsurge during the Spanish Civil War, and became exhausted in 1938 when the Soviet state obviously lost interest in transnational communication. Clark, however, does not explain convincingly why high-brow cosmopolitanism faded and xenophobia prevailed. One of the signs indicating the narrowing of horizons was the arrest of Koltsov, by then a hero of the Spanish Civil War in December 1938, and of several other cosmopolitan intellectuals, like Vsevolod Meyerhold. At the same time, the Western leftist elite became disillusioned because of the signing of the Molotov-Ribbentrop Pact in 1939. The end of the cultural ‘game’ with the West is represented by a colorful episode. A dismissed journalist, named Zhivov, was afraid to posses foreign books and offered his collection to the Foreign Language Library, but its director Margarita Rudomino was also apprehensive and refused them, and so Zhivov burned them (p. 342). Thorough analysis of the shifts in cultural politics in their multiple contexts makes the zigzags in Stalin’s politics more understandable in the many fields of Soviet life that still intrigue historians. This book is an example of sophisticated writing for well-educated readers. However, in the eyes of a historian, this work might tend to neglect statistics. Numbers could strengthen some of the statements of the author, for example the postulated increase of published translations or the percentage of poetry in journals. Statistics, however, is not a favored tool in cultural studies. Also, a historian may expect more exactness in dates, the lack of which is sometimes confusing, for example in the tragic story of Koltsov’s mistress Maria Osten (p. 337). But these minor details are outshone by the strengths of the book: the author’s vast erudition, its theoretical power, and its innovative topic and approach.